With rain pouring down on McKethan Stadium play stopped briefly so the grounds crew could dry the mound. Jordan Butler stood there for two or three minutes that probably felt likes hours given the situation. When Wesley Sweatt fell behind 2-0 Butler was looking for one pitch in one spot and he got it. The sophomore who made a surprise start at first base got what he was looking for and took advantage. Butler crushed a fastball low and inside over the scoreboard in right field sending his teammates over the dugout railing and into a frenzy. 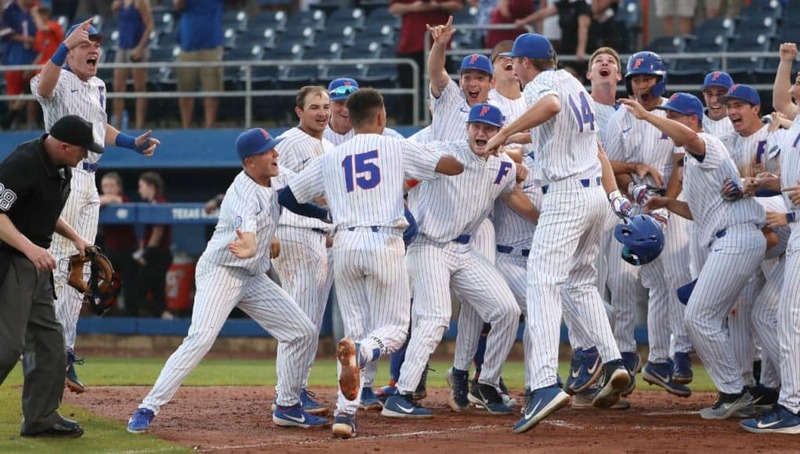 His three-run home run gave Florida a 6-4 win and a critical series victory over South Carolina. The lineup changes on Saturday were significant. Nelson Maldonado dinged up his shoulder sliding into home on Friday so Kevin O’Sullivan made the decision to give him a day off and with Wil Dalton struggling at the plate it was an opportunity to move Kendrick Calilao to right field and insert Butler into the lineup at first base. The decision paid off with Butler going 4-5 with two home runs on the day. South Carolina got on the board first with a solo home run in the top of the second. Butler connected on his first career home run in the bottom half of the inning to tie the game. 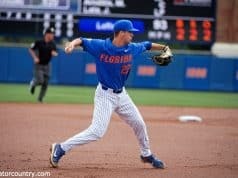 South Carolina responded with a run off of back-to-back doubles and Florida, once again, responded. Jacob Young walked and stole second. Austin Langworthy came through with a two out single to tie the game. In the fifth inning the Gamecocks got to Dyson, scoring two more runs. Noah Campbell started things off with an infield single. George Callil singled to right advancing Campbell to third. TJ Hopkins chopped a ball to third base, which was good enough to score Campbell and give South Carolina the lead. Dyson got one more out before O’Sullivan went to David Leuthje on the mound. The freshman allowed one more run to score, credited back to Dyson, but would throw 4.1 scoreless innings. 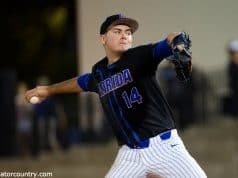 Florida improved to 6-9 in the SEC in what was as much of a “must win” game as any can be in the month of April. 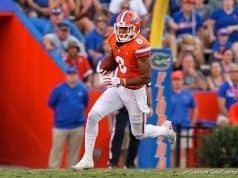 The Gators have a quick turnaround this week. They will play Jacksonville on Tuesday before heading to Baton Rouge for a three-game set starting Thursday.